HPR: Can you please tell us about the affirmative faith community? Juliann Rich: The affirmative faith community is a group of churches and church-goers who welcome all people who may have felt excluded by the church because of cultural or ethnic background, race, physical or mental abilities, socioeconomic or family status, gender, age or sexual orientation. They are devoted to issues of social justice and outreach. HPR: How did you line up with them? 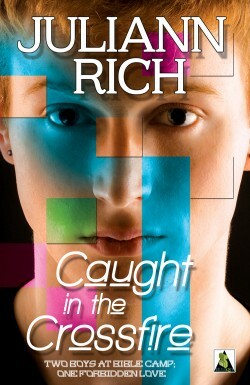 JR: William Weightman, the leader of the GLBT Inclusion Group at St. Stephen's Episcopal Church in Fargo (http://ststephensfargo.org/glbt-inclusion/) emailed me with the wonderful news that my first young adult novel, “Caught in the Crossfire,” had been chosen as the novel they wished to feature and give away at the Fargo-Moorhead Pride event. He invited me to come to Fargo-Moorhead to sign my book and visit with readers. HPR: I saw in your bio that your son is gay. It seems like this story could hit a little close to home. Was there a certain scenario that lead to the series? I apologize if that question is a bit personal. JR: Not too personal at all! Yes, this series came out of my love for my son as well as for my mother who struggled to find a place of acceptance due to her conservative Evangelical beliefs. I recognized that my mother's concerns were coming from a place of fear for my son's salvation. I also recognized that she did not understand how much pain my son was enduring as a result of having his very identity labeled sinful. After many years of trying to navigate these waters, I decided to write a novel featuring Jonathan Cooper, a 16-year-old young man who devoutly believes in God and who falls in love with another boy at Bible camp. I believed that Jonathan, through his first person narrative, would speak far more eloquently than I as to the struggles encountered when one's sexuality and spirituality seem at odds. HPR: Have you been to other Pride events to promote your book? If so, where and how was it received? JR: I have participated in the Minneapolis Pride event and was very welcomed! The LGBTQ community has been so gracious and accepting of my work as an affirming mom and advocate for LGBTQ rights. However, the religious issues in my novel have, at times, elicited a knee-jerk reaction of withdrawal from some within the community and that's understandable. Many of the people I've met have told me heartbreaking stories where people they love turn away from them with cold hearts and citations of Bible verses. I cannot tell you how honored I've felt to be entrusted with stories of pain and rejection. More often than not, conversations than have begun with skepticism have ended with mutual love and acceptance and with both parties touched by the other. This is precisely why I wrote “The Crossfire Trilogy.” I want so much for those whose hearts have been battered by religious discrimination to know that the affirmative faith community is real and flourishing and waiting to welcome them. HPR: How did your son react to the story? JR: My son, though he's found his authentic path outside the Christian church, has been incredibly supportive of me and “The Crossfire Trilogy.” He's front and center at all my book launches and sees this work for what it is — a love song dedicated to him. HPR: I noticed on your guest post for gayya.org you wrote the mother's perspective to help your mother understand your son's orientation. How did she react? JR: How many people in their late 70s have the ability to reexamine a lifetime of beliefs that have guided every decision? Not many — but my mom is one. It has been a journey that has required a lot of truth speaking and listening and extending respect but she has come full circle. In fact, my son just got married to the love of his life in June and who do you think was there to celebrate? HPR: Have you encountered much feedback from parents? JR: Oh yes! I receive, on average, one email per week from either a teen or a parent telling me how “The Crossfire Trilogy” has helped their families. Many teens write to tell me that they've given “Caught in the Crossfire” to their parents after coming out and how it has created a basis for communication. I frequently hear from parents who thank me for allowing them to see into their children's hearts through Jonathan Cooper, my main character. These emails are, without a doubt, the greatest joy I've experienced yet along this journey. HPR: Tell us a bit about your emerging author award. JR: Sure! It was an incredible honor. In 2014, I attended the Saints and Sinners Literary Festival in New Orleans, a literary event dedicated to celebrating and fostering LGBTQ literature. Unknown to me “Caught in the Crossfire” was nominated for the emerging writer award. An honor given to one debut author each year. This award is possible because of Rob Byrnes, a talented and generous author who believes in fostering new voices in the field. To be selected as a nominee was honor enough and I still cannot describe how I felt when my name was called as the winner. To be chosen, me — an ally to this community, was the highest form of praise and acceptance, and I am ever grateful. Sat, Aug. 15, 11 a.m. to 4 p.m.